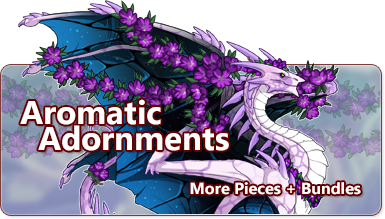 [center][permalink][img]http://www.flightrising.com/dropbox/forget-me-nots-and-fleur-de-lis-with-gratis-home-deliveries.png[/img][/permalink][/center] It might be the dead of winter, but a couple additions to your [b]botanical baubles[/b] might just inspire those around you to think about spring! In this update, we've added a [b]couple more pieces[/b] to each of our flower lei sets and are now offering them in [b]bundles[/b]! [center][permalink][b]Click here to read more about this update. [/b][/permalink][/center] [more] [size=5][b]A Few More Flowers[/b][/size] We've expanded our flower lei sets to include [b]two new pieces per color[/b] variation: [center][item=Sakura Tail Lei][item=Violet Tail Lei][item=Red Rose Tail Lei] [item=Marigold Tail Lei][item=Black Tulip Tail Lei][item=daisy tail lei][/center] [center][item=Sakura wing garland][item=Violet wing garland][item=Red Rose wing garland] [item=Marigold wing garland][item=Black Tulip wing garland][item=daisy wing garland][/center] We've also [b]updated the art[/b] on each of the [b]corsage[/b] pieces so that they more closely match their accompanying set. [i](NOTE: You may need to clear your browser's cache to see the updated art)[/i] [center][item=Sakura corsage][item=Violet corsage][item=Red Rose corsage] [item=Marigold corsage][item=Black Tulip corsage][item=daisy corsage][/center] In addition, we're now also making each wearable flower set available in [b]bundles[/b], which will begin stocking in the [b]Treasure Marketplace. [/b] [center][item=Sakura bloombox][item=Violet bloombox][item=Red Rose bloombox] [item=Marigold bloombox][item=Black Tulip bloombox][item=daisy bloombox][/center] --------- [size=5][b]Quick Progress Update: Lair Revamp[/b][/size] We wanted to provide everyone with a very brief update regarding the progress of our [b]Lair Revamp[/b] (which includes the Hibernal Den). Almost all corners of the [i]Flight Rising[/i] team have had their noses to the grindstone (or...keyboard, or tablet...), working hard to wrap up development on the feature. We're performing a lot of tests and polishing the experience as we go. While we don't have much in the way of a launch timeframe to share with you, we can assure you that things are progressing very well and we're so excited to launch it. And... we have a little treat! As many of you well know, one of the new options available within the revamp is the ability to move dragons into separate tabs. To further customize your lair or den, you can assign both names and icons to these tabs. Here are a selection of [b]tab icons[/b] that the art team has been working on, which will be launching with the revamp! [i](NOTE: There will be more icons than this; it's just a taste! )[/i] [center][img]http://www.flightrising.com/dropbox/prev_lairtabicons.png[/img][/center] We'll provide more updates as we get closer to release! It might be the dead of winter, but a couple additions to your botanical baubles might just inspire those around you to think about spring! In this update, we've added a couple more pieces to each of our flower lei sets and are now offering them in bundles! A bundle of sakura blooms that wrap around the tail. A bundle of violet blooms that wrap around the tail. A bundle of rose blooms that wrap around the tail. A bundle of marigold blooms that wrap around the tail. A bundle of tulip blooms that wrap around the tail. A bundle of daisy blooms that wrap around the tail. A gorgeous string of sakura blossoms to decorate the wings. A gorgeous string of violets to decorate the wings. A gorgeous string of roses to decorate the wings. A gorgeous string of marigolds to decorate the wings. A gorgeous string of tulips to decorate the wings. A gorgeous string of daisies to decorate the wings. A sakura corsage, a gift from a memorable someone. A violet corsage, a gift from a charming someone. A red rose corsage, a gift from a beloved someone. A marigold corsage, a gift from a cheerful someone. A black tulip corsage, a gift from a mysterious someone. A daisy corsage, a gift from a special someone. In addition, we're now also making each wearable flower set available in bundles, which will begin stocking in the Treasure Marketplace. A box of decorative daisies. Contains the Daisy Lei, Corsage, Crown, Tail Lei, and Wing Garland. We wanted to provide everyone with a very brief update regarding the progress of our Lair Revamp (which includes the Hibernal Den). Almost all corners of the Flight Rising team have had their noses to the grindstone (or...keyboard, or tablet...), working hard to wrap up development on the feature. We're performing a lot of tests and polishing the experience as we go. While we don't have much in the way of a launch timeframe to share with you, we can assure you that things are progressing very well and we're so excited to launch it. And... we have a little treat! As many of you well know, one of the new options available within the revamp is the ability to move dragons into separate tabs. To further customize your lair or den, you can assign both names and icons to these tabs. We'll provide more updates as we get closer to release! Yes, finally some good news! Thanks team for keeping us up to date with news! :D I'm gonna need a thousand of those garlands. Ask my clan questions here. Watch the Child of Forbidden Lover Scatter. Currently looking for: Azure-Spruce/Aqua-Seafoam/Denim-Thicket Nature G1. Wishlist, Girlfriend of Azurodin, I collect twin coatls. I am the twin hoarder.